Keros were celebratory objects, used among native Andeans for drinking and toasting on feast days. These vessels were usually produced in pairs and seem to embody deeply-held Andean notions of reciprocity. As seen here, keros were typically carved out of wood with slightly flaring openings. In the colonial period, patterns and designs were incised, inlaid and painted. 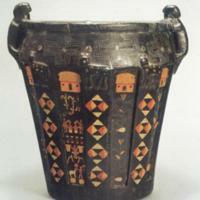 In this case, incised geometric patterns line the rim and base. Diamond-patterns and planting scenes run along the length of the kero. The pattern of the kero relies upon repeating elements. It has columns of diagonal forms resembling the fabric designs of tocapu, columns with corn plants with tasseled tops, and columns with scenes related to planting, harvest and its celebration. As part of the celebration, the artist has included a figure of a woman holding two large keros, one in each hand. Similar figures appear on several colonial keros. The colored portions of the kero were formed with a resin-paste known as mopa-mopa. Inlays of mopa-mopa were inset into the wood body of the kero so that they lay flush with the surface. This mode of kero decoration became common in the colonial period, and was also used on other kinds of objects. Contrasting to the two-dimensional mopa-mopa decoration of the kero's body are the three-dimensional carved handles that seem to represent felines, perhaps Andean pumas, which were associated with leadership and authority. Keros were usually commissioned by community leaders or other native Andean elites. 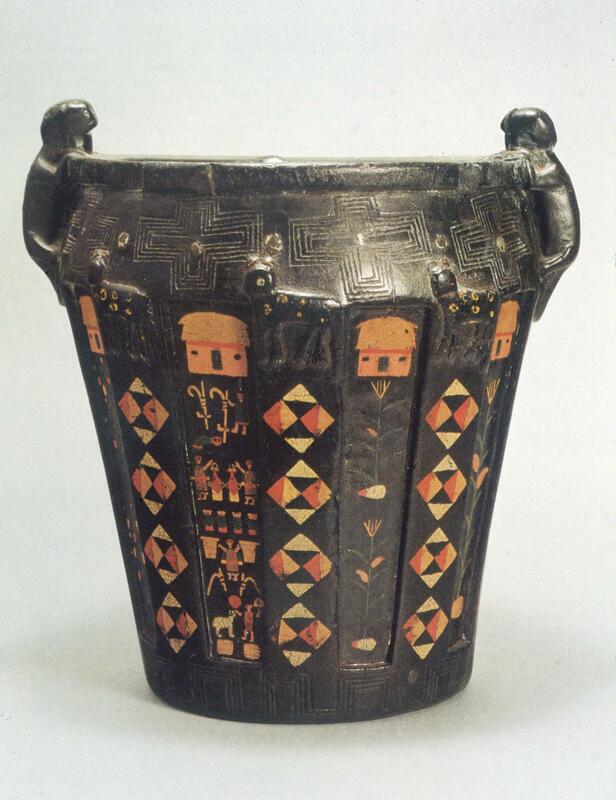 In some cases keros were used for drinking in ceremonies of the type depicted in, or referenced by their décor—such as celebrations of corn harvests. The specific history of this kero is not known, although based on other examples, it likely comes from Cuzco or a town nearby. The body of the kero and the animals perching on its edge were carved from the same, single piece of wood. Colored pastes made from a tropical plant resin mixed with pigment—an important mode of kero decoration across the colonial period—were inset to form the designs. The vessel measures ca. 24 cm in height (ca. 9.5 inches). Kero were made in pairs and often served as ritual gifts, cementing social and economic relations within communities. These vessels were also heirlooms, passed from generation to generation. Today the Museo Inka in Cuzco holds this kero and its mate is in Madrid, in the Museo de América. The production and use of keros extended from pre-Hispanic times through the colonial period. While the imagery of colonial keros does not exactly mirror pre-conquest models, vessels such as this one offer physical evidence of Andean desires to preserve and revive pre-Hispanic memories and practices. In the 16th century, and then again in the 18th, Spanish officials considered keros dangerous because they evoked Andean practices and beliefs that could be a challenge to Spanish authority. And it is clear from both kero imagery and historical documents that many of these vessels recalled a glorious and lost pre-Hispanic past. Some keros display battles in which the Inka emerged victorious over pre-Hispanic foes. Others feature planting ceremonies, as does this kero, with people dressed in an old, pre-Hispanic-style of clothing. Thus with every use, keros restated and lengthened the trajectory of indigenous authority in the Andes. Cummins, Thomas B.F. 2002. Toasts with the Inca: Andean Abstraction and Colonial Images on Quero Vessels. Ann Arbor: University of Michigan Press. Gisbert, Teresa. 1994. Iconografía y mitos indígenas en el arte. La Paz: Gisbert y Cía-Fundación BHN.